George Soros’ Open Society Foundations just became the second largest in the U.S. The Wall Street Journal reported Tuesday that George Soros has donated $18 billion of his personal wealth to his Open Society Foundations. This move will make OSF the second largest in the nation, only exceeded by the foundation formed by Microsoft billionaire Bill Gates. Soros has already made a name for himself in the non-profit world by supporting and sometimes creating practically every left-wing organization in the nation. We can only imagine what evil this portends for our future. This follows on the heels of the September appointment of Patrick Gaspard as OSF president. Gaspard, an Obama crony, served as chair of the Democratic National Committee. So while the Democratic Party may be losing donors like rats abandoning ship, the Democrat agenda is now funded with an additional $18 billion. This points up the Democrats’ big secret: even when political donations are hemorrhaging, the Democrats can rely on proxy organizations that work night and day to promote their leftwing agenda. Those foundations, like Gates ($44 billion in assets), Ford ($12 billion), Robert Wood Johnson ($10 billion), and many others, fund left-wing organizations and agendas to the tune of over $100 billion. Republicans and conservatives have nothing like this. But that’s not all. The federal government also funds many tax-exempt organizations, virtually all owned and staffed by Democrats. It has become little more than another massive funding vehicle for the Left. When you consider the fact that the Left owns the mass media, and that federal, state and local governments are virtually all staffed by liberals, the true picture emerges. This nation’s recent hard Left turn becomes easier to understand. We really are in a swamp. With crocodiles. George Soros just boosted that $100 billion by almost 20 percent. Soros only funds groups and agendas harmful to the U.S., so this could be a real game changer. The Department of Justice should consider what DOJ did to junk bond dealer Michael Milliken’s Drexel Burnham Lambert. DOJ threatened to seize Drexel Burnham Lambert’s assets under the Racketeer Influenced and Corrupt Organizations Act (RICO) statutes. Drexel settled for an unprecedented $650 million fine. Soros is in charge of a massive continuing criminal enterprise dedicated to America’s destruction. 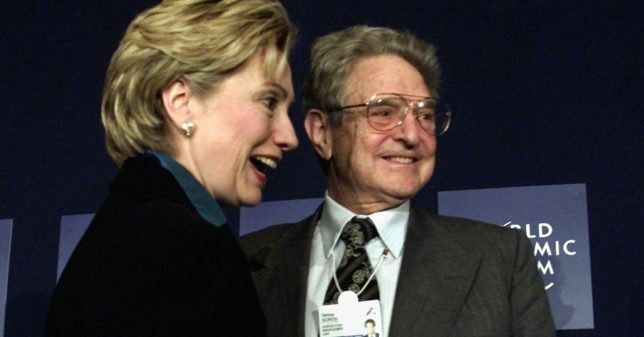 If there truly were justice in the world, Soros would be arrested and OSF assets would be seized under RICO. It couldn’t happen to a nicer guy. And for once, Soros’ billions would be put to good use.